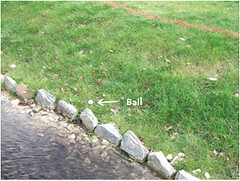 A player's ball lies close to an artificial stone wall inside the margin of a water hazard. Is the player entitled to take relief without penalty from the artificial stone wall? Each stone making up the wall is easily removable; may the player remove one or more stones to facilitate their stroke? No, there is no relief from an immovable obstruction when the ball lies within a water hazard. Rule 24-2b. No, the wall as a whole does not meet the definition of a movable obstruction and the individual stones are intended not to be moved. Therefore the wall is an immovable obstruction and all parts of it are deemed to be fixed. Decision 13-2/32. A player's ball lies within the margin of a water hazard. As he approaches it he sees an abandoned ball in the water and as he will have to wait until he can play his next stroke he gets out his ball retriever and fishes it out. Does he incur a penalty? No. As the player is obviously not using the ball retriever to test the water, Exception 1 to Rule 13-4 applies and no penalty is incurred.